Graveyards can be beautiful places to draw in, the contrast between precise stone sculpture and overgrown, wild, natural habitation has always been a favourite for art students. I am often to be found sketching in church yards around Edinburgh and over the years Canongate Kirk on the Royal Mile has become a favourite of mine. When I first started drawing for a living I sketched the kirk quite often for wedding stationary and invites for clients due to be married at the 17th-century church. 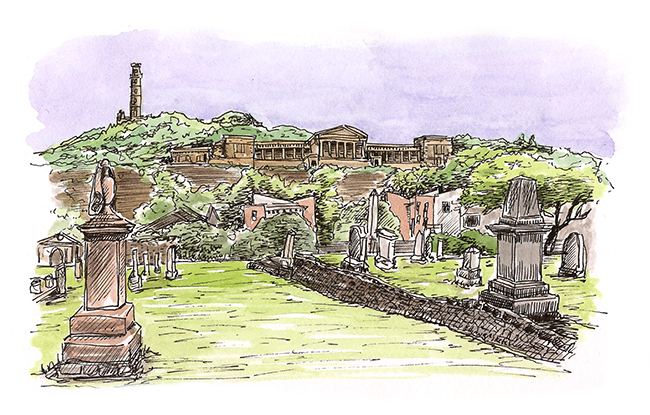 Current building work being carried out behind the Kirk may well change this view which I sketched last summer. I hope not too much as the view over to Calton Hill and the Old Royal High School is delightful. 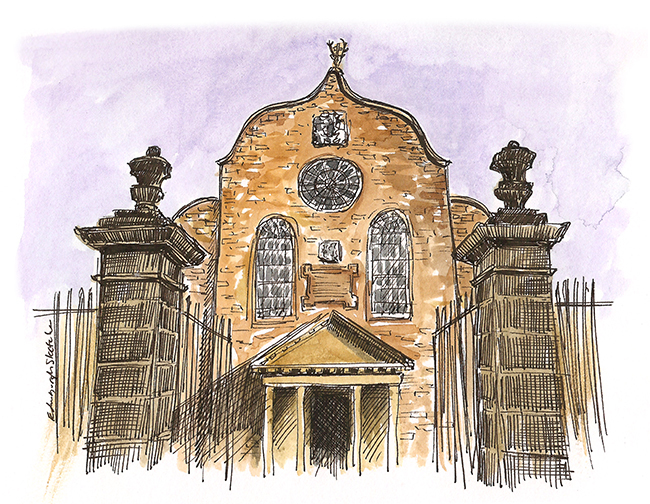 Below is a sketch of the front of the Canongate Kirk, both drawn in black ink with a watercolour wash.
Lorna Smith liked this on Facebook. Vicki Henderson liked this on Facebook. Fiona Henderson liked this on Facebook. Sarah Otey liked this on Facebook. Vicky Pearson liked this on Facebook. Marvellous Mary liked this on Facebook. Tammy Leipper Bunn liked this on Facebook. Suzanne Mary Snyder liked this on Facebook. Isabelle Labbé liked this on Facebook. Donald McGlynn liked this on Facebook. Janet Hays S liked this on Facebook. Red Walker liked this on Facebook. Karen Reyburn liked this on Facebook. Fiona Moore liked this on Facebook. Melanie Lee liked this on Facebook. Sue Pownall liked this on Facebook. Di Cater liked this on Facebook. Yvonne Hunter liked this on Facebook. Kanako Sobajima liked this on Facebook. Sheona Mathewson liked this on Facebook. Andrew Agler liked this on Facebook. Graham Polaroid liked this on Facebook. Claire Dunlop liked this on Facebook. Karianne Falck-Ytter liked this on Facebook. Alison White liked this on Facebook. Joan Ballantyne liked this on Facebook. Ann Other liked this on Facebook. Heather Mueller liked this on Facebook. This looks familiar! Wherever could I be? Bonnie Bulanda Purins liked this on Facebook. Nan Grossbarth liked this on Facebook. Gill Newall liked this on Facebook. Louie Pitcairn liked this on Facebook.